To contact the subscriptions department by telephone, please ring +44 (0)1778 395 165. Institutional subscriptions are also available in print and digital formats for universities, libraries and schools. If you choose to switch your subscription to direct debit – our best rate – you will receive a set of limited-edition postcards by Children’s Laureate and Literary Review cover illustrator Chris Riddell (while stocks last). Simply enter the code POSTCARD to take advantage of this offer. Renew your subscription here. Please note: our subscriptions page changed in February 2018. If you subscribed before that, when you visit the renewals page, you will need to click the ‘Find my Account’ tab and enter your details. Your subscription ID can be found on your renewal letters, on the carrier sheet that comes with each issue of the magazine and on the email confirmation received when first subscribing. Having found your account, please add the subscription you would like. Finally, please register in order to complete the purchase. And thank you for your patience! If you cannot find your subscription ID, please contact Warners, our subscription bureau, on +44 (0) 1778 395 165. 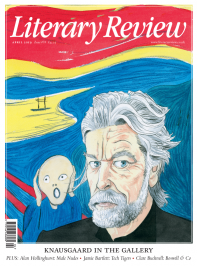 If you have a print subscription to Literary Review, you’re entitled to read all the pieces we have online for free. One option is to visit the regularly updated archive on our website. Please make sure you register before attempting to access the archive. You’ll need your subscription number (beginning E00) and delivery postcode. Alternatively, you can browse PDF replicas of all back issues for free (an app is also available for this function). To access the PDFs and app, please follow these instructions. Enter your subscription number (beginning E00) and delivery postcode. Create an account by entering an email address and creating a password. Access to the digital edition is yours. Lastly, if you would like to read Literary Review solely on our app, please visit Exact Editions. Gift subscriptions can be sent to UK, European and Worldwide destinations, for 1 and 2 years, or given as a rolling direct debit UK subscription, which offers our best rate. All donors can choose the starting issue of the subscription. When selected, click ‘view basket’ on the top right of the subscription page. You will then be invited to create an account for subscription. Please be aware that you’ll be asked to enter separate billing details and delivery details. If you have a discount code, please enter it at the top of the page before choosing your subscription. Literary Review offers institutional subscriptions for libraries, universities, places of learning and governmental departments. For further information, please click here. Institutional subscriptions include: access online and via the Literary Review app to all users; access to the full searchable archive going back to the magazine’s inception in 1979; authenticated access (included Shibboleth in the UK); statistical reporting available via the library admin’s account; individual page URLs for bibliographic referencing; full technical support via Exact Editions. Literary Review subscriptions are handled by our subscription bureau, Warners. You can take out a subscription from Warners by calling them on (+44) 1778 395 165 or via this website. To subscribe, click here and follow the instructions for new subscribers, buying a subscription as a gift, or renewing a subscription, as appropriate. To change your subscription address, please contact our subscription bureau, Warners. They can be reached on (+44) 1778 395 165 or email. How do I access premium content on this site? Premium content is available to anyone with a valid Literary Review subscription. To access premium content for the first time, click ‘Register’ in the header and enter your name, email address, subscription ID (beginning E00) and delivery postcode. An email will be sent to you containing an activation link which provides you with a secure password. Please note, your subscription ID and delivery postcode must match those found on your subscription confirmation email or on the carrier sheet that comes with each issue of the magazine. I’m a subscriber – why can’t I see the content? Once you have signed in to the website, you’ll be able to view all the reviews and back issues. How do I find my subscription ID? Your subscription ID can be found on your renewal letters, on the carrier sheet that comes with each issue of the magazine and on the email confirmation received when first subscribing. If you did not receive such an email or cannot otherwise find your subscription ID, please call or email Warners, our subscription bureau, on (+44) 1778 395 165 or email. Once you have a Literary Review subscription, register here to view our archive of articles. Please ensure this is your correct email address as you will be emailed with further details. This is printed on your magazine delivery slip and included in your subscription email after online purchase. Once submitted, we will send you a registration confirmation email to validate the email address you have just entered. You will receive this email immediately after you have submitted your registration, but please allow up to 20 minutes for it to arrive. If you do not receive an email from our site, please check that it has not been sent to your spam or junk folders. If so, please mark it as a legitimate email. Hotmail, Gmail, Googlemail users, please check your Spam or Promotions folders. The registration confirmation email confirms your username and provides you with a link to set your password. Please click that link. The link in the registration confirmation email will take you to the page on our site to set your password. You will see that we have already created a password for you. Please copy this or type in a strong password of your own. Make a note of the password – note that strong passwords are not always easy to remember, so please copy/paste it somewhere safe. When this is done, click the ‘set password’ button. You will be directed to a page confirming that this has been successfully set. Once you’ve registered on our site, you can sign in to access the premium articles on our site. Once you’ve registered, you will receive a registration confirmation email immediately afterwards, but please allow up to 20 minutes for it to arrive. If you’re looking to change your password, click ‘Sign In’ at the top right of this site, and click the ‘lost my password’ link. You’ll be prompted to pick a new password. You can set a new password easily. Click ‘Sign In‘ at the top right of this site, and click the ‘lost my password’ link. You’ll be prompted to pick a new password. Unfortunately, we cannot reset your Username – however, do remember that you can Sign In using your Email Address in this field instead. Remember you can sign in using either your Username OR your Email Address. When you enter incorrect details during Sign In, the screen will display relevant error messages to help you resolve the problem – usually this is an incorrect or mismatching Username or Password. If you are having trouble with your Username, try to Sign In with your Email Address instead. If your Username/Email Address is correct, then your password you are entering does not match, so you can set a new password. Perhaps the password on your account was not set? Sometimes after registering, subscribers do not click on the registration confirmation email we automatically send. The quickest way to determine this is to follow the procedure to set a new password. 1) You will see a message informing you the Username you entered is invalid, or that we do not have an account matching your email address. In this case, please Register. 2) Your Username or Email Address is registered on our site, and we will send you a notification to your Email Address which includes a link to set a new password. If you’re looking to change your delivery address or update your subscription, contact our subscriptions bureau, Warners. They can be reached on (+44) 1778 395 165 or email. If you’re looking to correct details previously entered incorrectly when trying to access premium content on this website, such as a subscription ID or a delivery postcode, click ‘Sign In’ at the top right of this site and you will be prompted to enter the correct details. How do I change my subscription ID / delivery postcode for registering? If you have tried to register for the website and did not have your subscription ID (beginning E00) or delivery postcode to hand, you will be invited to re-enter those details whenever you try to sign in. Simply click ‘Sign in’ on the top right of this site and enter the correct details when you have them available. Once signed in, please look at your ‘My Subscription‘ page to see whether there are any errors. The on-screen readouts will indicate the problem and advise how to resolve it. Your subscription ID (beginning E00) can be found on your renewal letters, on the carrier sheet that comes with each issue of the magazine and on the email confirmation received when first subscribing. The delivery details we have on our records can be fiound alongside your Subscriber Number (above). Please note that this is the postcode for the sddress to which your copies of Literary Review are delivered. Literary Review subscriptions are handled by our subscription bureau, Warners. You can renew your subscription from Warners by calling them on (+44) 1778 395 165 or via this website. If your problem does not appear to be caused by any of the above, please email website@literaryreview.co.uk and we will do our best to help you.